Designed to deliver in a world where reliability is everything! Qioptiq, an Excelitas Technologies Company, is the world’s principal designer and manufacturer of infra-red and image intensified and fused night vision equipment. With more than 100,000 individual night sights supplied to over 56 different countries worldwide. We have been a leading manufacturer of optics and optical modules for infrared detection, warning and imaging systems for decades. Not only for weapon sights, our infrared systems components are used in equipment designed to detect and track any kind of thermal targets, including missiles, tanks, armoured vehicles, helicopters and fighters; they are utilised for situational awareness or to detect threats related to thermal light emission. Qioptiq is an R&D powerhouse with more than 200 people devoted to the design and development of state-of-the-art photonics and processes. This ensures we are able to meet all our customers present and future photonic needs. Always with one eye on the future, ready to evaluate and develop new technologies to best meet the requirements of our ultimate customers, the end User, by providing them with mission winning equipment and capability. The roadmap for Surveillance and Target Acquisition (STA) is becoming increasingly interesting as potentially revolutionary capabilities make their way up the Technology Readiness Level (TRL) ladder. With Fused Weapon Sights and Digital Optical Weapon Sights (DOWS) now progressing along the evaluation roadmap for emerging programmes, Qioptiq are continuing to focus on “the digital generation”. Digitising sighting systems is very relevant to the future of the DCC Users, and DOWS is an important step along that journey. Digital Weapon Sights can offer enhancements due to advances in low power processors (predominantly driven by the smartphone market) and high resolution CMOS sensors, which have the ability to operate at a higher wavelength than the human eye, therefore offering potential low light enhancement. Coupled with high optical / digital magnification capability, enhancing Detect, Recognition, Identify (DRI) capability is a reality, therefore reducing the number of pieces of kit the User needs to carry, which has positive reduction effects to both physical & cognitive burdens. Commercial technology development has really opened up a huge potential for enhanced sighting systems. For example, it’s amazing what you can “cram” in to modern smartphone processors. The smartphone market has moved aggressively and delivered huge processing capability in low power, compact packages. The time is right to start tapping into this commercial development and exploit it for enhancing DCC digitally augmented sighting systems. We are looking to take commercial world capability and employ it in the military environment. Emerging sensor technology, coupled with novel optics will allow Positive Identification (PiD) of potential targets at the maximum effective range of the weapons they are integrated with, which significantly increases User survivability and allows additional time for decision making. Human integration factors are also key as we need to ensure we keep a check on complexity and information overload, as with any other complex integration issue. Another area of significant interest is the use of image processing to assist with target detection and identification in order to support the User with early target location and tracking. Augmented Reality (AR) has been demonstrated within military equipment over the last few years. Qioptiq have demonstrated the benefit of integrating and displaying target cueing information into weapon sights to provide enhanced situational awareness and target designation across a networked battlefield. AR provides the potential to improve the capability of the Individual Soldier by providing targeting / navigation information within the weapon sight view or via lightweight helmet mounted displays, therefore reducing the need for other display devices to be carried & accessed. We are feeding this experience into our R&D projects for UK and International Customers. Compact Laser Range Finders and other positional, direction & orientation sensors are also being integrated into compact “clusters” in order to provide accurate range, bearing and location information in order to reduce target location error and therefore increase precision of effect. The potential for an Integrated sight for the Dismounted Soldier allowing him to send / receive location and targeting data 24hrs a day and in all weathers is now a reality as the building blocks start to slot into place. “Integration” is still a common cry amongst the DCC community, as the focus to reduce weight continues. With many nations quoting figures in the region of 55-60kg carried by its dismounted users, then the issue is very real, so we all need to do our bit. 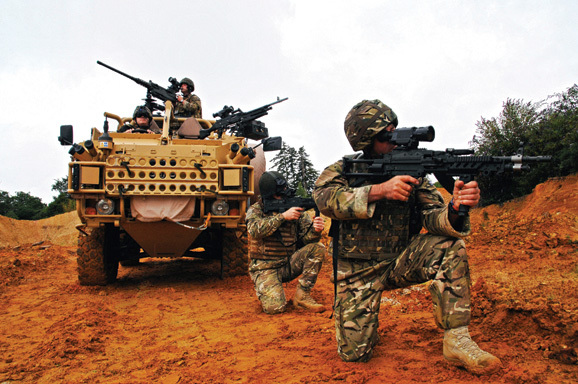 The Integrated Weapon Sub System (WSS) has been explored by a number of nations as part of their respective Soldier Modernisation Programmes (SMP’s) with varying degrees of success, however the challenge remains. Powered Interface Rails and flexible power architectures offer potential for weight reduction & closer integration. This initiative requires a close working co-operation between the weapon manufactures, sighting system providers and the power industry, along with common interfaces and transportable design standards in order to allow customers to maintain a choice of solution providers. Sighting Systems need to be easy to use, effective through all weathers and provide the ability to detect targets at the maximum range possible in order to prepare the User for the next course of action. The Urban scenario requires enhanced situational awareness, wide fields of view and a rapid engagement process in order to respond within close quarters. The challenge for us is to provide all of this capability to the User in a package (or suite) that is easy to use and easily configurable for role / mission requirements, whilst remaining affordable and having the potential to endure a service life of 10-15 years. However, even with all of the new developments ongoing, we haven’t lost sight of the fact that over the past few years a number of our NATO / ISAF customers have procured equipment in support of their operational requirements, including the UK MoD. With worldwide focus firmly set on cost control and a desire to reduce operational commitments, it may be sometime until we see a resurgence of monolithic modernisation programmes. Modification is a more palatable way of ensuring the warfighter has the tools to conduct his mission and remain technologically one step ahead of his enemy. 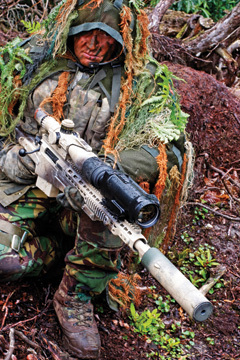 Qioptiq has been involved with thermal weapon sight programmes since the mid 90‘s. The early years had given us an insight into just how fast the technology was moving in this field when compared to other technology such as image intensified tubes, the advancement of which has been slow in comparison. This insight gave Qioptiq the foresight to build an architecture that could be modified to keep pace with technology and take into account obsolescence. Obsolescence will start to become a thorn in the side for many forces. As urgent procurements for operations were made in relatively small numbers, it is not unreasonable to expect the thermal core inside the weapon sight to become obsolete. The options will be to do a life time buy, scrap or modify. Modification can enhance capability whilst causing minimum disruption to operations, training and logistic chains. Power consumption is reduced which means fewer batteries. The reduction in the consumption of batteries alone will go some way to cover the cost of the modifications. Detection and resolution are increased and 17u ITAR free technology can be used; User groups can be prioritised to ensure the right equipment is with the right user in the right theatre and the force will remain at the top of the technological tree. But we know from our long experience that it’s not about designing the next “shiny” thing just because we can. It’s about developing the right equipment for the User and then supporting that equipment. Qioptiq deliver a fully integrated support service that totally satisfies the customers’ needs. Having developed the skills, experience and commitment to meet the challenges of Customer Services – today and in the future, Qioptiq provide a tailored, flexible, cost effective, customer-focused service applied by experienced, highly trained staff with widely acknowledged expertise in all aspects of support. The product range is supported by user and maintenance training services, maintenance facilities, technical advice and in-service support. Qioptiq is also able to offer a complete contractor logistic support service, encompassing equipment availability, obsolescence management and user level spares. Working in partnership with the customer to drive down costs across the life of the equipment, Qioptiq designs, manufactures and provides through life support for photonic products and solutions to maximise equipment availability and to guarantee continuous through-life customer service for mission critical equipment. Qioptiq, along with our industry partners, are totally committed to reducing the size, weight and power burden placed on to our customers – developing the battle winning equipment within the realistic constraints of technology while maintaining affordability. We will continue to develop, push forward and challenge the boundaries to ensure we always stay one step ahead. We will continue to work with our customers to fully meet their needs and we will always be there to support them.